Zambeef: building communities in Chaisa. Crowds turn out for the opening of Zambeef’s Chaisa Macro. Zambeef Products Plc is the largest integrated cold chain food products and agribusiness company in Zambia and one of the largest in the region, involved in the primary production, processing, distribution and retailing of beef, chicken, pork, milk, eggs, dairy products, fish, flour and stockfeed, throughout Zambia and the surrounding region, as well as Nigeria and Ghana. It has 206 retail outlets throughout Zambia and West Africa. The company is one of the largest suppliers of beef in Zambia. Five beef abattoirs and three feedlots located throughout Zambia, with a capacity to slaughter 100,000 cattle a year. Zambeef produced 18.1 million kgs of beef in 2018. It is also one of the largest chicken and egg producers in Zambia, producing 16.9 million day-old chicks a year and processing 12.8 million kgs of chickens in 2018. 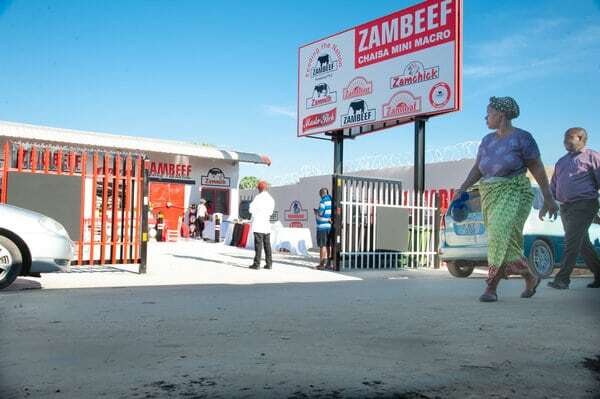 Zambeef Products Plc, listed on the Lusaka Stock Exchange, is the largest vertically integrated food retailing brand in Zambia. The Group is principally involved in the production, processing, distribution and… READ MORE.